Kyabgon Gongma Trizin Rinpoche, aka His Holiness Ratna Vajra Rinpoche (Tib. རཏྣ་བཛྲ་རིན་པོ་ཆེ།) (b. 1974) is the current throneholder of the Sakya school. 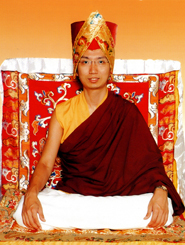 Kyabgon Gongma Trizin Rinpoche was born in Dehra Dun, India as the eldest son of Kyabgon Gongma Trichen Rinpoche and a member of Tibet’s noble Khön family who founded the Sakya school in the eleventh and twelfth centuries. Since early childhood he has undertaken the intensive traditional training for lineage holders. He is well known for the brilliance and clarity of his teachings and his fluency and excellent command of English. On the 9th of March 2017, Ratna Vajra Rinpoche was enthroned as the 42nd Sakya Trizin. ↑ His full name is: Ngawang Kunga Lodro Wangchuk Rinchen Jigme Trinley. ↑ 19th November 1974, the fifth of the tenth lunar month.